I had already intended to speak, of the nearest publication of a book on the JG 2. 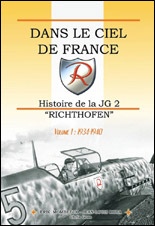 And, I just Saw on the web site of the « Aérobibliothèque” the cover of the 1st volume on the JG 2 and I would like to ask questions at M. Eric Mombeek (like it attends this forum) on this subject. First , concerning the title "1919-1941", I would like to know why you chose the date of 1919 ? That seems to be a little bit strange at first approach, is this for to show that the republic of Weimar is an explanation for the creation of the Luftwaffe and the first signs of the disastrous regime who will follow? I all cases if you deal with the period post first WW and with the former JG 131 “Richtofen” I congratulate you because the story of the Luftwaffe between the two Wars was very poorly reported. Another question, I would like to know if you have an idea of the date for the release of the book and an approximate of the price. Do you will make a subscription? I wanted to also know how much volumes are laid down (and possibly, the temporal cutting of each one). Lastly, last question, are testimonys of pilots abundant in the book (as it was, for example, the case in the chronicle on the JG 300 of Mr. Jean-Yves Lorant)? It will book contain a list of the losses human and material of the squadron, to see a list of the pilots? Anyway thanks to you M. Eric Mombeek and to M. J.L Roba for to offer us this Chronicle on a “Geschwader “unfortunately poorly addressed. First time I've seen the cover, although I am aiming for the German version. Happy to see the theme continued. If Erik happens to come across the question above, perhaps he can also shed some light on JG 5 Vol 3? Finally, will JG 2 become a 3 volume work? thanks for your interest. I am glad to give some precisions on this study of JG 2 coming soon. Regarding the dates on the cover: yes, we will cover the years between both wars in details while JG 2 has its origins in the unit which gave birth to the whole Luftwaffe. And it was interesting to study the process of the birth of the Jagdwaffe through the creation of the future JG 2. Fortunately, the last 25 years we met many veterans who were there at that time, including Edu Neumann, Wolfgang Falck, Galland, Losigkeit, Braunschweig, Kaufmann, Strümpell, ... and so many others who, telling how they lived that period, gave a living and authentic picture of the situation. I hoped to be able to publish the vol. 1 before Xmas, but I start to wonder if it will be possible: nearly each day, I received or found new material, and it was very difficult to decide to stop and definitively start with the lay-out. Now it is done, I started this week-end, but this will be a bit short to be ready next month. So, I would say: end of January?? There will be 2 other volumes: probably 42-43 and 44-45, it depends of the size of volume 1 when laid-out: more of 500 photos are pre-selected for that volume. Hope that you will enjoy reading and looking at this work. We enjoyed making it. Vol 3 JG 5? I was a bit sorried to be unable to sell more copies of Volume 2. So I must wait until +/- 300 more copies are sold before to finance this final volume. in the first chapter of this JG 2 chronicle, we shall publish interesting photos of the "Red Baron". One of them has on its back the name of the pilots standing together with v. Richthofen (see attached). But unfortunately, I am only able to recognize the first half of these men, thus until v. Richthofen self (my knowledge on this matter is very deficient). Can anybody recognize the names? I thought to show this list to Norman Franks but I don't have his new e-mail address. PS: by the way, is Jim Crow using or not an e-mail? Aue (ace with 10 vict.) ist correct. But I don't find a Franzen on the WWI aviation related web-sites. Number 6 could be another name. 1,3,5,7 were all in Jasta 10 late 1917 early 1918. Perhaps the JG 5 vol.2 (and vol. 1) would have sold a lot better had it been done in a better selling language (=English). I know several potential buyers who haven´t bought these books due to that very reason. thanks a lot for the identification! I'll include your remarks in the caption. You are right Jukka. Initially I tried to publish the books in German, to make a kind of thank for those hundreds of nice men, Luftwaffe veterans, who welcomed me, told their story, replied to letters... Unfortunately many of them are gone now, or too old to be able to read books; e.g. the fantastic Wolfgang Falck who was so kind to help any researcher and whose health is not the best at the moment. I thought that the interest to this story would grow with the next generation, but it is not the case, or very slowly. So I hope to close the JG 5 chronicle in German, and then, as you say, work in other languages used by more people interested by this subject. Erik, I'm glad to read the above. Do you have any possible publishers for your translated "Jagdgeschwader 4" yet. Both volumes would be great to have along with the hopeful finishing of J. Prien's JG3 in english.